This feature is only available to Office 365 subscribers. Subscribers get new features and improvements monthly. Click to try or buy a subscription. Also, QuickStarter is available only in: English (United States), French (France), Italian (Italy), German (Germany), Spanish (Spain), and Japanese (Japan). 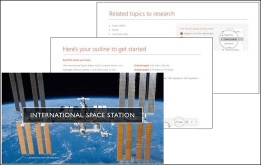 PowerPoint QuickStarter builds an outline to help you get started researching a subject of your choosing. A table of contents, based on selections you made. A slide for each subject, sometimes with additional suggested talking points in the Notes below the slide. A concluding slide, "Works Cited," where you list the sources of information you used for research. Images included in the outline are public domain or licensed under Creative Commons. Specify a subject to search on, or choose from a popular subject shown at the bottom of the dialog box. If you have not previously turned on Office Intelligent Services, you'll encounter a dialog box asking you to do so. You'll need to turn on Intelligent Services in order to use QuickStarter. QuickStarter gathers information and presents you with a list of subjects related to the topic you searched on. If you see inappropriate content, move your mouse pointer over it, click the more (...) command in the upper right corner of the icon, and select Report inappropriate topic. Pick a design for the slides in the presentation, and then click Create. 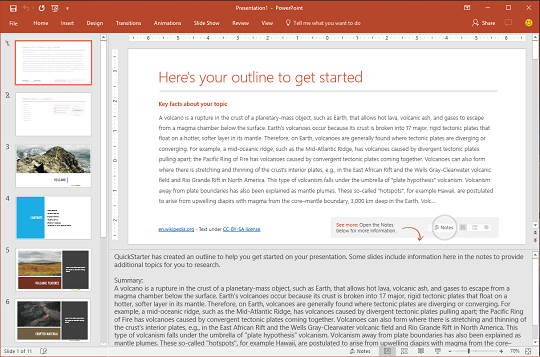 PowerPoint puts together your outline presentation and opens it for you. Read the outline and begin doing your research. Use the key facts (on slide 1) and related topics (slide 2) for ideas as you research and write about your subject. Sometimes, there is additional information in the Notes below the slide. The first slide in the presentation is, "Here's your outline." It includes a summary about the topic, and usually includes dates and other kinds of useful information. Any paragraph on the slide that is truncated by an ellipsis (...) is repeated in full in the slide Notes below. The second slide in the presentation is "Related topics." This slide lists terms worth researching further. 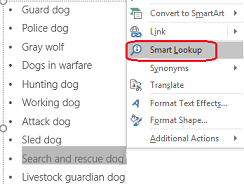 You can begin by selecting a word or phrase in the outline, right-clicking it, and choosing Smart Lookup to see definitions, websites, and top related searches from the web about that term. Other slides in the presentation will be about a suggested subject (based on the subjects you chose while creating the outline). Some slides about suggested subjects also include suggested talking points, which are listed in the Notes pane for that slide. To add variety to the look and feel of your presentation, open Design Ideas by going to Design > Design Ideas.